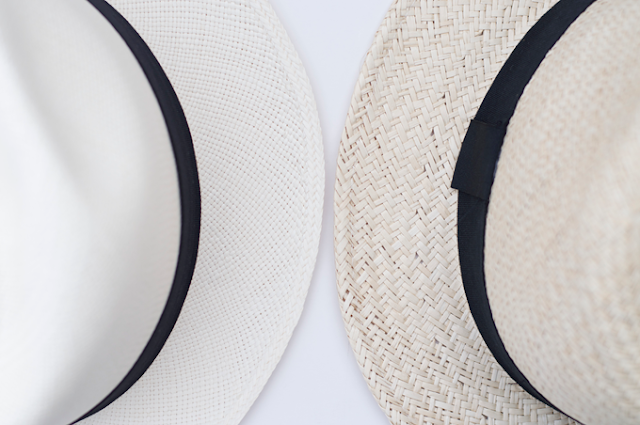 Not all Panama Hats are the same. As a matter of fact... there is a lot of information that goes into choosing the right hat for you. Panama hats are super popular and I can see why. They are stylish, keep you cool, and well....stylish! Keep reading because I am sharing a discount code at the bottom!! Woot! I am lucky enough to be one of those people that can wear a hat. Not everyone can pull it off, so I am glad I can. 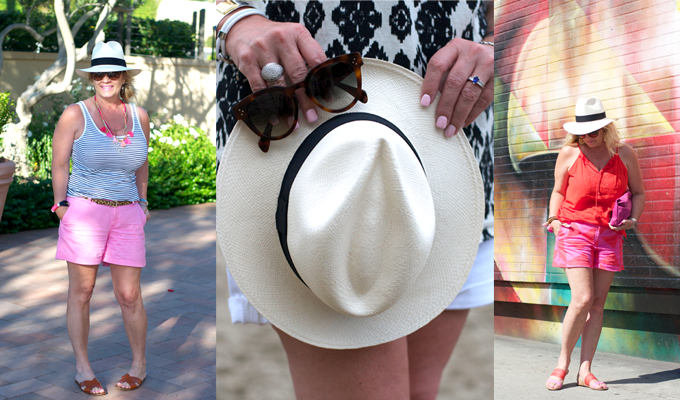 Today I am going to share with you what to look for and tips on how to shop for your Panama Hat. Started by two sisters, Katie and Kelly fell in love with the handmade accessories from Ecuador. Katie's husband is from Ecuador and thru their travels is how she was introduced to the artisan goods. Sharing the idea with her sister of offering these fine handmade goods; Muchana was born! I met Kelly one afternoon to discuss hats and to pick mine out. I tried on a few different sizes to see what was my best fit. I chose a white hat, although they come in a few other colors as well. Let me share a little history before I tell you what detail and craftsmanship goes into each and every hat. While touring the Panama Canal, former President Teddy Roosevelt was photographed in a paja toquilla hat. Although the hats themselves had been around for years....from then on the hats were referred to and better know as the Panama Hat. Funny how a trip can impact not only the country, but the fashion world as well! Hand woven in Ecuador for hundreds of years, artisans spend upwards of eight weeks making a single hat. Some even longer. The weave of the hat will determine the price. The tighter the weave the higher the price. I have seen hats in excess of $7,000. Intricate designs, and even your name can be woven into your hat. The process starts with paja toquilla cutting it, drying, then soaking to work the straw to make it weavable. Going thru a 10+ step process, no two hats are identical as each one is handmade lending to how unique and special this investment item becomes in your wardrobe. 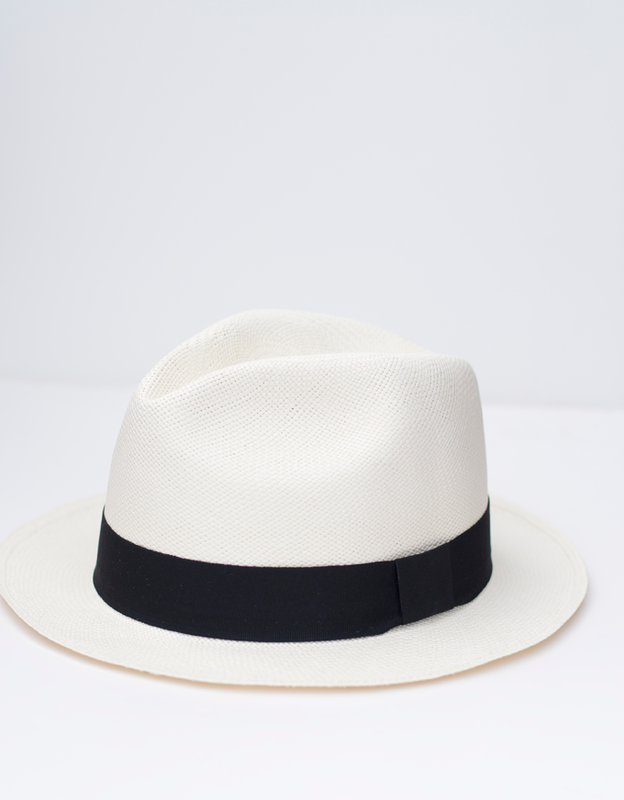 A good Panama hat is an investment item. You can read about investment pieces for your wardrobe here. As you saw in my recent trip to California here, here, and here, I wore my hat a lot! I decided to pack my hat rather than wear it traveling. 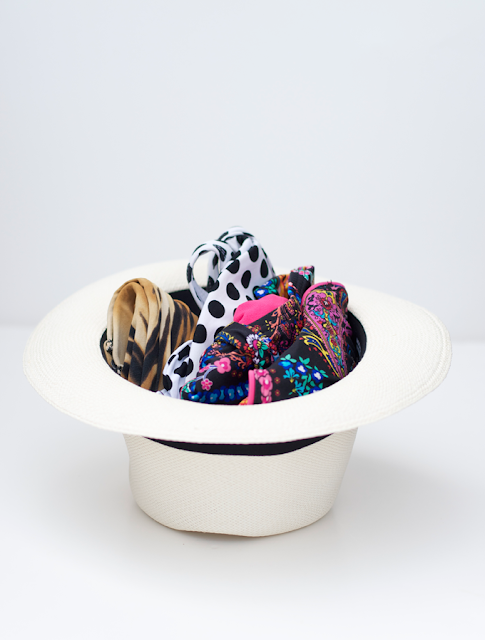 The best way to pack your hat is to place smaller items inside the hat and place it in the middle of your suitcase and place your rolled up clothing around it. I placed my swimsuits in my hat, but socks, tanks, or your bra and undies will work as well. I loved the shade and protection from the sun it brought to my face as well as looking stylish. Far better than sporting a baseball cap for shade that's for sure! While they are extremely durable, you do want to know how to care for your hat so it will last you for many years. As I said before... not all hats are created equal. I own a "panama hat" from H&M and it is no where near the same as my Muchana hat. I bought it to use for when I was in water, or perhaps had suntan oil or lotion on my hands. Take a look at the photos below of the difference in the weave. The texture is smooth and soft on my Muchana hat while the texture on my H&M hat is course and rough. I'm not knocking my H&M hat.... just pointing out the details to show you there is a place for both my hats. To care for your hat there a few things you need to know. Handle your hat by the brim. I know it seems natural to just pick it up by the crease but don't. It will encourage your weave to weaken and could cause breakage. Cleaning your hat. If your hat gets a spot, lightly wipe it with a soft dry cloth. Do not add moisture. Panama hats are sun hats... not rain hats. Moisture can cause your hat to misshape and shrink. And while I am mentioning shrinking, your hat will slightly shrink with wear. 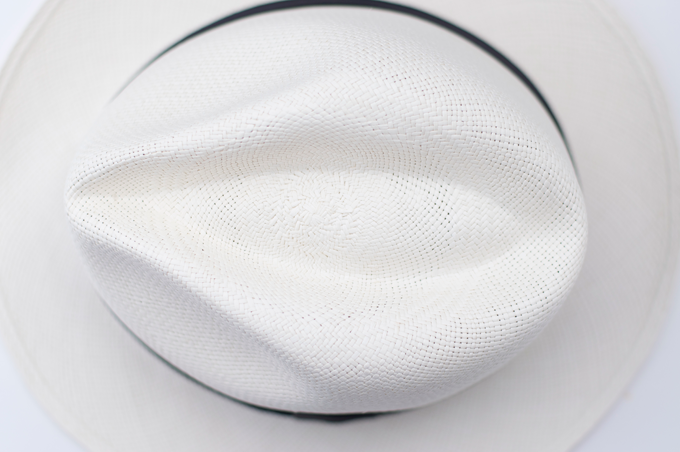 This is natural as your head with perspire around the brim. You want your hat to fit snugly but not tight if that makes sense. If your hats gets wet (accidents happen) allow it to dry naturally without heat. Once dry, to flatten your brim there are two methods. 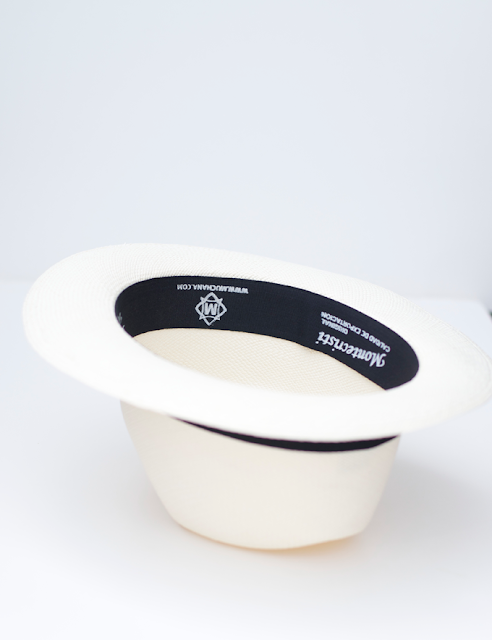 You may gently shape the brim by using a iron on LOW heat with a soft cotton cloth between the hat and iron. Or what I like to do is lay your hat on a flat surface and place items such as books on the brim and let sit overnight. Storing your hat. I know some people will tell you to roll your hat for storage but I do not recommend this. Store your hat in a area away from direct sunlight and upside down. Make sure the hat is stored in a area with air movement as you want it to breath.